In the meantime enjoy this marvelous process..and by all means, read on! 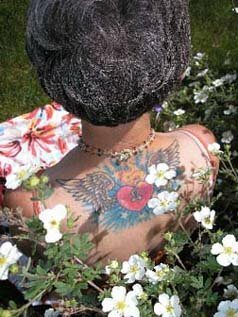 I had the pleasure and honor of interviewing Seena Frost, creator of SoulCollage! Click here to read her interview. What happens in a workshop? ~ How are the cards made? A sacred space of trust and support is always established within our circle of participants. After a brief introduction to the basics of SoulCollage®,...in a zen-like manner you allow the images to be drawn to you; then, cutting and arranging them in a way that 'feels right'...and finally gluing them to card-size mat board. You are now on your way to creating a deck of self-discovery cards that is rich in personal meaning which you can consult throughout your life's journey. How are the cards used? Whether you have one card or many, you will learn to dialogue with and listen to the voices of your card-energies...which are deeper expressions of you! As you "let SoulCollage® have its way with you" ...more love, understanding and compassion for yourself and others invites its way into your life. This relaxing, creative process tiptoes past the chattering mind ..and invites us to explore...create... discover..forgive, heal, and celebrate ourselves! As an option...each card can eventually fit into one of four suggested themes...or suits (see below). As you create your deck, distinguish these suits, and "do readings" from your cards...you are integrating a variety of aspects of your being, and life; and tapping into the wisdom these aspects within you, as well. SoulCollage is a relaxing and nurturing self-care practice. Committee Suit: Discover and acknowledge your inner-voices, and hear what they really want you to know. Community Suit: Honor and integrate the wisdom and guidance of the people, and pets in your life, past and present. Companions Suit: Learn about the chakra-animal companion connection and their guiding energy. Council Suit: Learn about archetypes and discover those that guide you daily, or have been an influence in your personal history. SoulCollage helps us identify the many aspects of ourselves, some of which we might not be aware of...and allows us to further understand, accept and express the fullness of who we are... and move farther along our life's journey less encumbered, and more empowered & joyful! My cards can be seen here and here. I invite you to become a part of this Supportive Circle and take part in a creative, intimate dance with your deepest self. I really, really like this new site, and the way all your soulcollage® sites are all linked over thar>. Well.. now that I am taking a vacation from "work" and have plenty of free time perhaps I will complete my very first card. I got emersed in raw chocolate making tonight, but as little orphan annie sings "there's always tomorow." Reading some of your cards was very helpful to me tonight, so I don't need to make my own!! ~ha ha just joking. You are a beautiful person. I wish you soooo much success with your work shops ~ if I was near I would take one for sure. I'm always happy to hear from you! OK, you've got my mouth watering with your raw chocolate! I'll stop by your blog so I can eat my heart out. If you were closer, I'd order some of your raw food delights. Who knows...maybe some items you will eventually do mail order..?? I'm excited that you will be creating your first card. Can't wait to see it. As things develop I will create a space for a card gallery. I'd love to have your cards on display here too...to inspire others...and me! I'm glad my cards have assisted you..that's the power of this incredible process. Thank you for your compliments and good wishes with my workshops! I wish you were closer, I'd love to have you in my workshops! Who knows...as time goes by maybe I'll do a few in your area! I am doing a standing ovation for you over here! This site looks wonderful and so informative! My heartfelt wishes for you in this new direction you have taken. I know you will be a magnificent facilitator! Many blessings to you my friend. Thanks! Well I created my first one last night as you are aware of~ lol... and I really do find it fascinating that viewing other's cards they created for themselves ( such as yourself and the daily reading ones) can have such a personal relevance for myself~ kinda like listening to a song on the radio that is that muscian's personal expression and relating it to my own life..... fantastic.. it takes a village. And now this online/ phone workshop starting on May 18th ? That is just a fantastic concept. Thank you so much for your enthusiasic cheers and wishes! I do appreciate it very much. I can see you smiling my way right now! I'm thrilled that you've experienced the making your first SoulCollage card,as well as it's message to you, which will be ongoing. Yes, this work is indescribable!...we can only try though :). You are in for a glorious ride. See you on May 18 at the Tele-playshop! Thanks for stopping by my blog a few days ago. This is an interesting project. Good luck with your endeavor. Where ever your IMPRESSIVE SITE may travel in cyberspace, it will leave happy and inspirational Soulprints of Cheryl and her message of SoulCollage! Beautiful Soulprints of Kindness, Intelligence, Creativity, Authenticity and Compassion! This morning as I walked along Kokomo Beach in Key West, I saw your Soulprint in the Sand! Because of your work, this may be a perfect day to "surf the soul"! THANK YOU! I am so deeply moved by your loving message. I am so thankful that my work has made a difference, and I'm grateful that yours has made a big one for me. Kindred find each other - their soul prints lead the way...I love it when that happens! I have so many and every single one is my biggest treasure. Thank you for putting together all of this wonderful work. God bless your talents and soul! I can't wait to hang out and explore our inner animal guides at Anne Marie and Anne's workshop. Your site is brilliantly shiny! Hi Cheryl, Thanks so much for dropping by my blog! I hope your next SoulCollage event goes wonderfully! Meet Seena Frost, M. Div., M.A. SoulCollage® cards are made either from one’s own art or from images found in materials which have been bought by or given to the SoulCollage card maker. These collaged cards are used only for the cardmaker’s own inner exploration. 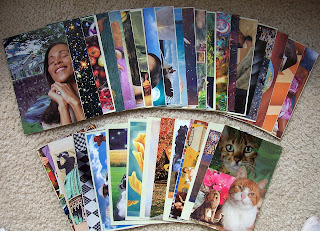 SoulCollage cards are not sold, traded, bartered, or copied (except as a back-up for the cardmakers own use) as is stated in the Principles of SoulCollage®. Where SoulCollage cards are available to be seen by others, it is for the purposes either of demonstrating the SoulCollage process or of sharing the cardmakers' inner process in the context of community. SoulCollage® is grateful to the artists and photographers who make this deep awakening process possible and in all ways SoulCollage® seeks to be respectful of their rights. All content on www.acapellasoul2.blogspot.com/ is Copyrighted © by Cheryl A Finley 2006, 2007. Articles may be reprinted by permission only with copyright notice in tact.